Thanks, guys – that’s great information. I’ve reached out to both suppliers (Chestnut and KEDA) to ask them some questions relevant to applying dye on the lathe. I’m also looking for suppliers in Canada. Chestnut doesn’t seem to be available to me at all but KEDA seems to be reasonable for shipping from the US. The youtube video was quite helpful. I watched 2 or 3 of the KEDA videos and it gave me some good ideas about layering different colours to make the grain REALLY pop. FWIW … I have been using KEDA dyes for 3 or 4 years now, and have been very happy with the results. Maybe I should do a review. I’m not sure about how color-fast they are, but I haven’t seen any changes in the pieces I have dyed over the years. I always use alcohol (DNA), but KEDA uses rubbing alcohol because doesn’t evaporate quite as fast … he says better for blending. 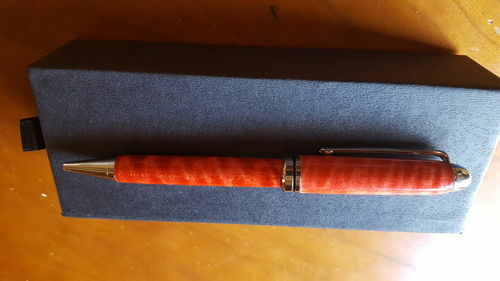 I used full strength Trans Tint red on this pen made from tiger maple. Kept the pen spinning for 2 minutes then applied several coats of CA. A little of the dye came off with the first coat of CA, but it was not a noticeable change in appearance on the pen. I’ve used the powdered aniline dyes from lee valley, mixing with alcohol instead of water, with good results. They dry pretty much as they are going on. I’ve been in touch over email with Keith from KEDA and he was pretty helpful. He recommended the liquid dyes mixed with alcohol for an the almost instant dry I’m after. Trouble is, his liquid dyes aren’t available to me in Canada. Have you been using liquid or powder? I can get his powdered dyes in Canada and mix them with alcohol. When you say “full strength”, do you mean you didn’t cut the liquid dye at all (i.e. used it as the concentrate) or that you mixed it at the recommended full strength? That’s great to know. I do get to Lee Valley often enough. It could be worth trying them as well. The colours on the Lee Valley website look pretty dull but it may just be that they didn’t do the best presentation with their dyes. I use their powdered dyes and mix myself with alcohol. Shaun: The aniline dyes looks quite dull when they dry. When you put a finish on them, they pop. I believe that the ones you want are what LV calls aniline mixing colour. You can mix different colours together to get pretty much any colour you want. The more powder to alcohol, the deeper the colour.